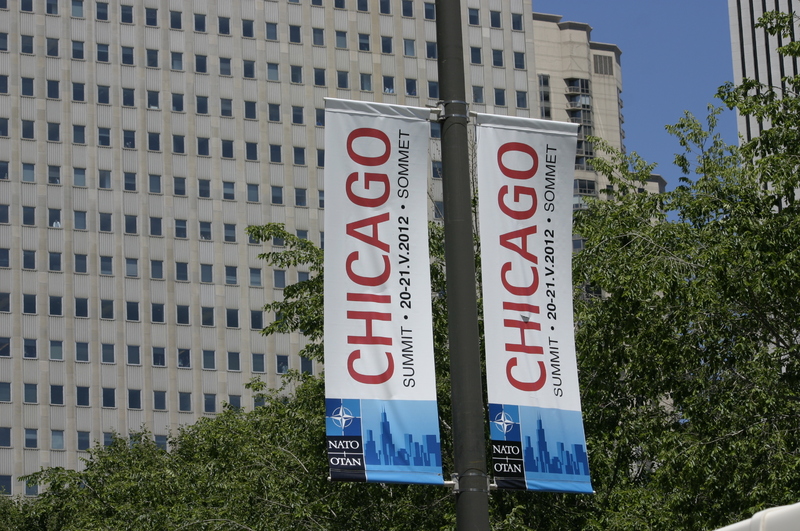 For those of you who live in Chicago, you’ll know that NATO brought a tad bit of fear, chaos and traffic jams to the city. Over two days, world leaders met with the Obamas and with Rahm Emanuel who carries the hopes of spiking Chicago’s tourism in the years to come by approximately $1 billion. It’s amazing what showing off the skyscrapers can do. While first ladies were being given tours of the Art Institute and Barack Obama was hosting a working lunch at Soldier Field, protesters from around the United States took to the streets to protest everything from home foreclosures to the end of the Iraq and Afghan wars. The most moving of the week-long event (the one which I missed) had to be Sunday’s protest where a group of war veterans gave back their medals in anger and outrage that the war hasn’t yet come to an end. The protests went well into the night, causing a clash at McCormick Place between some anarchistic protesters and the Chicago Police Department. In the following photos that I took Monday morning/afternoon, you will see the amount of security on the city’s streets. This is what a militaristic society may look like with beetles walking around. Hopefully, here in Chicago we will never know. Needless to say, they hauled out everyone from Homeland Security to the Secret Service. In a few photos, you will see white vans lined up along Jackson Avenue and Loomis Street. You’ll also see the Chevy trucks lined up on the street outside of the Federal Building downtown. Relatively quiet, the marchers didn’t make their way into the downtown area until around noon and by the time I left, were gathered on Randolph Street near Millennium Park. After a week-long protest calendar, it was observed that many of the protesters out Monday were of the younger generation. Melissa Howe, a native of Chicago, said that she had always wanted to get involved in Occupy Chicago but hadn’t and thought the NATO Summit would be a good time. Which made me question what she was protesting. As a student in Pennsylvania, the only thing I could imagine would be banks on the premise of high student loans in the future. A New Yorker with a guitar, Stephen Clark, 23, said that he had come out because the capitalistic society that we live in had taken over the music industry in a way that allowed for subliminal messages and bad music to get on the radio waves. “The music industry is ruled by the one percent,” he said. Clark studied music in New York. You will also see photos of him below. While many extreme protesters came out to recreate 1968’s National Democratic Convention, more called for a solitary movement, understanding that it was necessary to stand together. One would have to think that the CPD at this point, are a little more level-headed. Yet, I may be overestimating. With officers there to keep watch and maintain peace, protesters were in no way limited to what they could say. In the same sense, the CPD also have to keep in mind that it wasn’t too long ago when they were having their own fight with the king of Chicago. A couple of years ago, Daley had a hard time negotiating with the CPD over their contracts and while I may be suffering from an economic crisis, I’m not putting my life on the line every day. In support for our 17,000 police officers, it’s only fair, isn’t it? There are more similarities than differences among the CPD and those protesting. Just like everything else, opinions will be different from one person to the next, but pinning one group of people against the other just doesn’t work. Chicago has every right to protect its city and if we have to pull everyone out to do it, so be it. There were plans for Molotov cocktails to be thrown at four police stations Obama’s headquarters and Rahm Emanuel’s home. Good thing they got those guys. Please note, these photos are not edited. I wanted to get them out as soon as possible. Photos cannot be used without the written consent of the photographer. From what I’ve heard, there were a small number of bad eggs stirring up trouble on both sides.